Startseite 〉 Aktuelles 〉 Keine Stützkäufe für klimaschädliche Unternehmen durch die Europäische Zentralbank! Keine Stützkäufe für klimaschädliche Unternehmen durch die Europäische Zentralbank! Veröffentlicht am 16. Dezember 2016 um 19:06 Uhr. Im Rahmen ihres Unternehmensanleihen-Aufkaufprogrammes pumpt die EZB zur Stärkung der Konjunktur Milliarden Euro in die Europäische Wirtschaft. Dabei macht sie kaum Unterschiede, welchen Unternehmen sie Mittel zur Verfügung stellt. Schon im September wurde bekannt, dass rund eine halbe Milliarde Euro an den spanischen Energieriesen Repsol flossen. Ein Unternehmen, dass maßgeblich zur Beschleunigung des Klimawandels beiträgt. Dazu kommt noch: Finanzielle Beteiligung an solchen Unternehmen entpuppen sich immer mehr als riskante Investitionen, denn der wirtschaftliche Wert dieser Unternehmen wird immer weiter sinken, je stärker der Umbau in eine kohlenstofffreie oder kohlenstoffarme Wirtschaft vorankommt. Auf diese finanziellen Stabilitätsrisiken weißt gar eine eigene Untersuchung des wissenschaftlichen Beirates des Europäischen Risiko- und Stabilitätsausschusses hin. Ein Gremium, das die EZB mit wichtiger Expertise unterstützt. An diesen Rat scheint sich die EZB jedoch nicht halten zu wollen. Eine Untersuchung des Corporate Europe Observatories zeigt nun: Die EZB hat im Jahr 2016 rund 11 mal Anleihen von Shell, 16 mal von ENI, 6 mal von Repsol, 6 mal von OMV und 7 mal von Total gekauft. Die exakten Summen dieser Käufe sind nicht bekannt doch man kann davon ausgehen, dass sie erheblich sind. Zusammen mit weiteren Grünen Europaabgeordneten haben wir die EZB nun dazu aufgefordert dieses klimaschädliche und finanziell riskante Unterfangen einzustellen und ökologische und soziale Kriterien in ihrem Ankaufprogramm zu berücksichtigen. 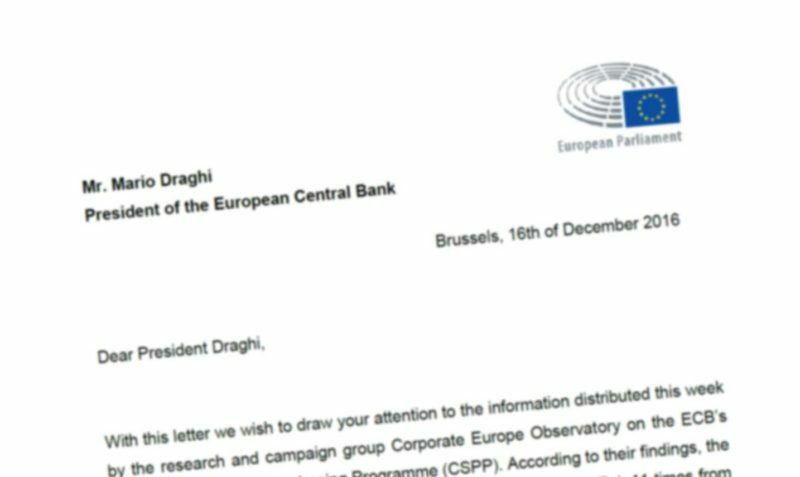 With this letter we wish to draw your attention to the information distributed this week by the research and campaign group Corporate Europe Observatory on the ECB’s Corporate Securities Purchasing Programme (CSPP). According to their findings, the ECB has acquired assets no less than 16 times from oil company Eni, 11 times from Shell and Gas Natural Fenosa, 7 times from Total and 6 times from Repsol and OMV. There is an important lack of transparency in this programme, as the total amounts are not available and the names of the companies are codified, therefore the general public does not have access to this data, while the advanced investors are fully aware of it. However the high number of trades indicates considerable investments in European companies that are contributing the most to climate change and whose business models are strikingly incompatible with a 2°C transformation scenario. It is not our intention to challenge the full compliance of the purchases under the CSPP with the ECB’s legal framework. But, now that EU has ratified the Paris Agreement, we have a tremendous challenge to orderly decarbonise our economy. At least 75% of fossil fuel reserves have to be kept in the ground to reach the 2° global warming limit agreed in Paris. 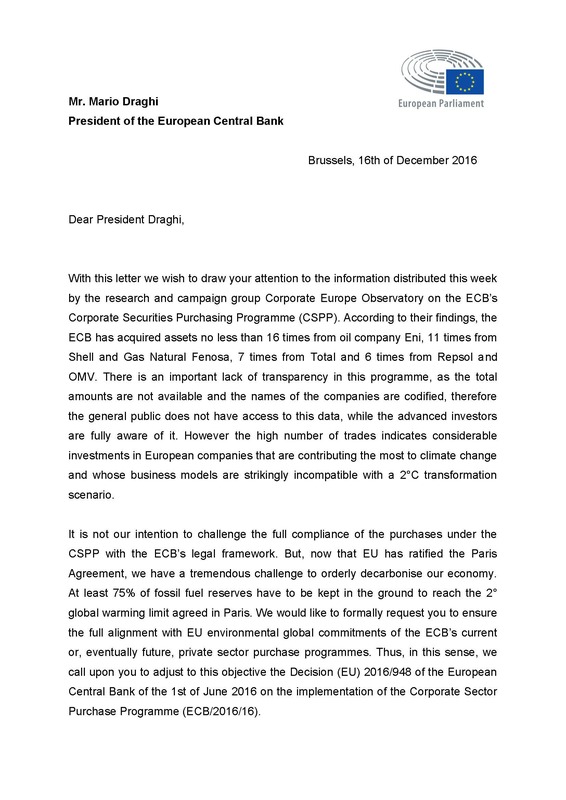 We would like to formally request you to ensure the full alignment with EU environmental global commitments of the ECB’s current or, eventually future, private sector purchase programmes. Thus, in this sense, we call upon you to adjust to this objective the Decision (EU) 2016/948 of the European Central Bank of the 1st of June 2016 on the implementation of the Corporate Sector Purchase Programme (ECB/2016/16). Furthermore, we would like to draw your attention to the climate related risks for our financial system deriving from companies with a high carbon-intensity and respective assets. 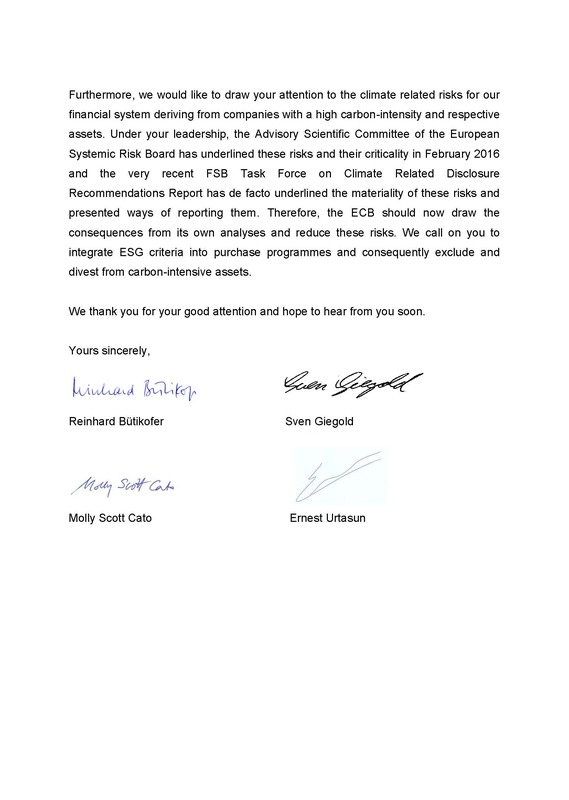 Under your leadership, the Advisory Scientific Committee of the European Systemic Risk Board has underlined these risks and their criticality in February 2016 and the very recent FSB Task Force on Climate Related Disclosure Recommendations Report has de facto underlined the materiality of these risks and presented ways of reporting them. Therefore, the ECB should now draw the consequences from its own analyses and reduce these risks. We call on you to integrate ESG criteria into purchase programmes and consequently exclude and divest from carbon-intensive assets. We thank you for your good attention and hope to hear from you soon.